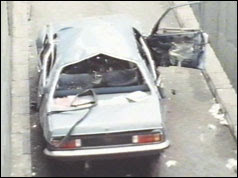 It would be wrong to mention anniversaries and not refer to the assassination by car-bomb of Airey Neave MP on March 30 1979. Tory Historian well remembers the shock of hearing that his car blew up as he was driving it out of the Westminster Palace yard. Neave was a wholly admirable man, a war hero, the first to make "a home run" from Colditz, who then served in Military Intelligence and took part in the Nuremeberg Trials, flawed though these were. 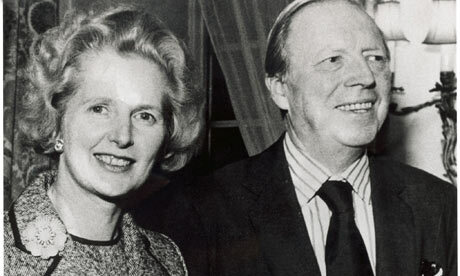 Subsequently, he was a close adviser to Margaret Thatcher, concerned particularly with Northern Ireland and the security services. Anything like that, inevitably, produces loony conspiracy theories and there were many people on the left and on the right who could not accept that Airey Neave was assassinated by the Irish National Liberation Army (INLA), a splinter group of the IRA. There were also conspiracy theories about Neave himself. The Wikipedia entry gives a fascinating list of all those theories and their adherents. It is somewhat disconcerting to find that Tony Benn's reaction when presented with arguments that Neave wanted to have him assassinated were considerably saner than Enoch Powell's who maintained that the assassination had been organized by the Americans or by MI6. Perhaps both. 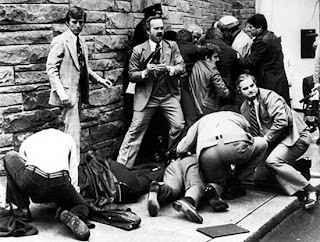 The biggest of all: on March 30, 1981 there was an attempt to assassinate President Reagan, which very nearly succeeded. The two pictures of the security services in action and Reagan being hustled off into a car, thence to a hospital, do not give the full story - he was far more seriously wounded than anyone, including him, realized at first. There was a moment of high comedy when Secretary of State Alexander Haig announced that he was in charge until the Vice-President, George H. W. Bush could get back to Washington DC. In actual fact the Secretary of State comes below the Vice-President, the Speaker of the House (Tip O'Neill) and the President pro tempore of the Senate (J. Storm Thurmond). But details like that were not going to stop Haig. 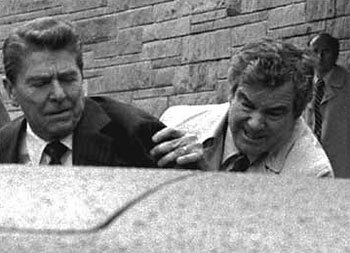 In any case, the Veep flew back and Reagan recovered remarkably quickly, given that his lung had been punctured. There is a wonderful, though unsubstantiated story of Reagan being wheeled to the operating theatre and him saying with his usual impish grin to the surgeon: "I hope you are a Republican." The surgeon is supposed to have replied: "Mr President, today we are all Republicans." Si non e vero, e ben trovato. One interesting aspect of that attempt, the first any American President had actually survived, is not generally discussed, and that is the effect it had on Tecumseh's Curse. Tory Historian remembers reading about that curse, supposedly put upon President William Harrison by the brother of the defeated Shawnee chief, Tecumseh, in an early edition of Ripley's Believe it or Not, which enumerated all the presidents elected in the year with 0 at the end (that is, every twenty years) who died in office starting with Harrison, elected in 1840 only to die in 1841. The book had been published in 1930 and the section on Tecumseh's Curse with the portentous: 1940 ????? As we know, the man elected in 1940, Franklin D. Roosevelt, did die in office, as did the man elected in 1960, John F. Kennedy. But not the man elected in 1980, who survived that assassination attempt or the man elected, in 2,000, George W. Bush. I think we can assume that by surviving Reagan broke the curse. Having spent so long on the Reagan story Tory Historian feels that the other anniversaries, some bad like the assassination of Airey Neave MP, the death of the Queen Mother, some good like the ending of the Rosenberg trial with them being found guilty of espionage and some simply hilarious like John Major climbing on his famous soap box during the 1992 election campaign, deserve separate postings. The death of Queen Elizabeth I on March 24, 1603 meant that James VI of Scotland succeeded to the English throne as James I of England. This brought about the de facto union of the two countries under the Crown. Of course, the death of a lady who is 105, has lived a good life and died peacefully is not a tragic matter but this news saddened Tory Historian a little. Andree Peel, Agent Rose in the Resistance, who saved 100 or more Allied servicemen, survived Nazi concentration camps and escaped the firing squad, died earlier this month and is being buried today. Tory Historian cannot help feeling that the manager of the care home where Mrs Peel had lived and died ought not to have been inteviewed if all she could come up with was a completely trite comment that makes one wonder if she actually remembers which one Mrs Peel was: "We are all a bit shell-shocked here. She was lovely - an amazing character with such a strong spirit." Tory Historian was particularly impressed by the information that some time after her husband's death, Mrs Peel "found companionship with Brian Westaway, a fellow Lampton House resident". One of the four patron saints of this country, St Patrick is, as far as anyone can establish, an interesting character. It did not surprise Tory Historian to find out that much of the mythology associated with St Paddy was either invented later or has more to do with other characters of the period. Saint Patrick's Day (17 March) is celebrated both in and outside of Ireland, as both a liturgical and non-liturgical holiday. In the dioceses of Ireland it is a both a solemnity and a holy day of obligation and outside of Ireland, it can be a celebration of Ireland itself. One more thing to remember about St Patrick: so far as anyone can tell, he was born in Roman Britain and was something of a foreigner or, at least, an outsider in Ireland. Tory Historian is immensely grateful to a sadly anonymous commenter on a previous posting on a clerical detective, who has pointed out that the excellent website, Clerical Detectives has moved. Here is the link. Very well worth browsing and following up on suggestions. In 1741 Arne filed a complaint in Chancery pertaining to a breach of musical copyright and claimed that some of his theatrical songs had been printed and sold by Henry Roberts and John Johnson, the London booksellers and music distributors. The matter was settled out of court. Arne was certainly one of the very first composers to have appealed to the law over copyright issues. It seems impossible to put up this posting without a video of Rule Britannia from one of the many Last Nights of the Proms. Tory Historian is spoilt for choice. Perhaps this one from 2008 with Bryn Terfel singing the solo. 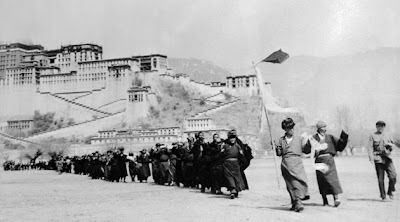 Two pictures from the Tibetan uprising against Chinese rule that broke out on March 10, 1959 and was suppressed swiftly and brutally. 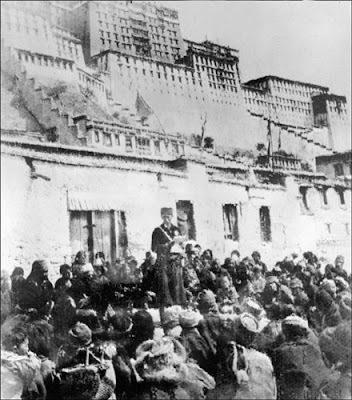 These two show a Chinese officer addressing Tibetans after the uprising had been put down and refugees leaving in large numbers. The Guardian has a whole selection of photographs. Not a round date but Tory Historian likes to celebrate this one. 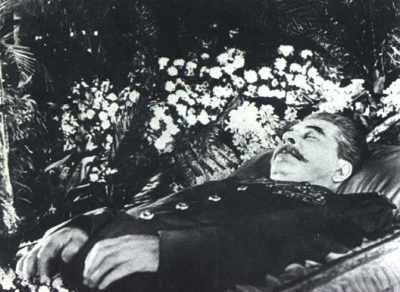 March 5, 1953 was the day when the death of Joseph Vissarionovich Stalin, one of the greatest mass murderers of all times (probably Mao Tse-Tung was worse but who is counting) was announced. There is some mystery, according to various accounts, not least by his daughter Svetlana, as to whether he did die on that day or the day before. Had he simply had a stroke and his entourage was too scared to do anything about it, hoping that he would simply die and that would be that? Possible. The picture of the funeral procession does not show the exact truth. 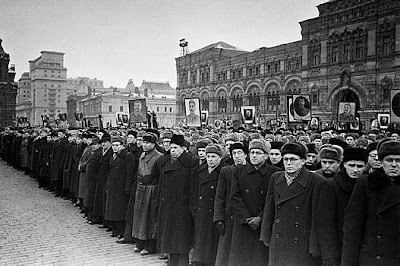 As Moscow was filled with crowds who were ordered to process, the side streets were closed off by the police and the secret police. People who tried to get out because of the ever growing numbers found their way blocked and there was a huge crush with unknown numbers killed in it. As Stalin lived, so he died - in a sea of blood.